One environmental activist claims the surge in suicides among India's farmers is related to a system of agriculture that has higher production costs than the farmer can cover with earnings. 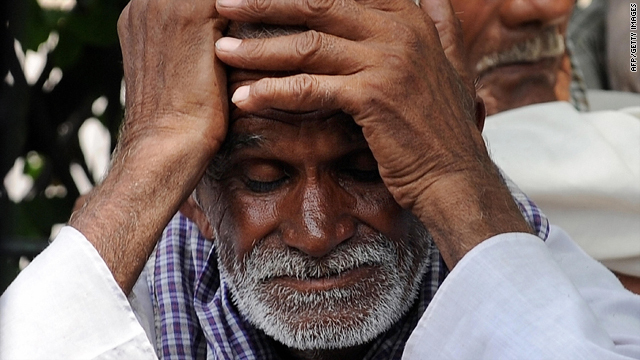 (CNN) -- Thousands of poor farmers in India have committed suicide over the past decade as changes in India's agricultural policy set off a widening spiral of debt and despair, one environmental activist said Tuesday. "The farmer suicides started in 1997. That's when the corporate seed control started," Vandana Shiva told CNN's Christiane Amanpour. "And it's directly related to indebtedness, and indebtedness created by two factors linked to globalization." For Shiva, who works with farming communities across India, those two factors were the ceding of control of the seed supply to the corporate chemical industry -- leading to increased production costs for already-struggling farmers -- as well as falling food prices in a global agricultural economy. An estimated 200,000 farmers have taken their own lives in India over the past 13 years, according to Indian government statistics. "The combination is unpayable debt, and it's the day the farmer is going to lose his land for chemicals and seeds, that is the day the farmer drinks pesticide," Shiva said. "And it's totally related to a negative economy, of an agriculture that costs more in production than the farmer can ever earn." But Columbia University Economics Professor Jagdish Bhagwati, a former adviser to the Indian government, said that globalization was not responsible for the surge of suicides among cotton farmers in the Indian states of Maharastra and Andhra Pradesh. "There are other states in India where cotton seeds have been absorbed and which are really prosperous. So you have to ask, why is it that these are breaking out?" he asked. "What's happening is very much like the subprime mortgages in the United States, where a whole bunch of salesmen went out and sold mortgages to people who couldn't afford them."